Providing you the best range of induction coils, anchor ring, self and mutual inductance coils and induced current apparatus with effective & timely delivery. 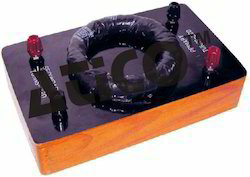 Advanced Technocracy Inc. is Manufacturer, Exporter & Supplier of Induction Coils. This consists of a specimen of iron in a ring form would with two uniformly spaced coils of wires. Soft iron ring is of dia. 75mm and cross sectional dia. is 9mm. The primary winding consists of 200 turns of insulated copper wire of proper gauge with binding post terminals and secondary winding consists of about 25 turns of fine wire. Has primary coil of 3000 turns and secondary coil of 1000, 2000 and 3000 turns. Has primary coil of 500 turns and secondary coil of 100, 250 and 500 turns with different tappings, mounted on wooden bobbins 25mm diameter per pair. 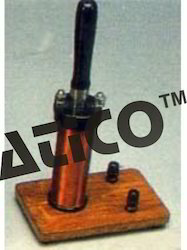 It has the bulb in secondary and make and break arrangement in primary to show the phenomenon of self and mutual induction and principle of induction coil, workable on 6 volts. Looking for Induction, Mutual Inductance Coils and Electrical-Vibration ?